Back in 2014 we had a neighbor who would call the police on himself all the time. I had called the police 2 nights prior to this incident because he started screaming and yelling at no one because no one was around...but he claimed that the managers son had threatened his life and he wanted a restraining order. So this guys calls the police, I know this because he was outside while he was screaming at dispatch on his phone. No one went to jail because the incident never happened. This guy has brain damage from an accident and his mother pays for all his bills but in the mean time he drove us all crazy and because of the way he acted all the time the manager finally evicted him. He lived 2 doors from me so we got front row seats to the insanity. 3 days ago a neighbor asked the manager and maintenance man to do a welfare check on an elderly neighbor because no one had seen him for 2 days. The manager didn't want to so the neighbor called police and asked them to do a welfare check on the guy. They came at 10pm and since the manager wouldn't answer the emergency phone or her door, they kicked the door in and found the elderly man had died in his bed. Police and the coroner were in the apartment for hours and we went to bed. 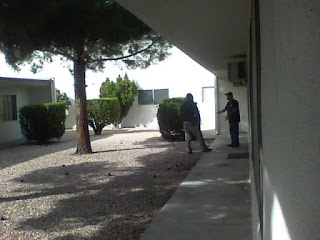 The next day Ken was talking to the maintenance guy and said the manager called the man's son who lives in another state and his son said he wanted nothing from the apartment so the manager and maintenance guy went through the apartment and took what they wanted before trashing the apartment out. The comical thing was that people from that courtyard were standing around outside while they were taking things out of the apartment and the maintenance guy said a couple of people asked about certain things the guy had and if they could have it if no one else wanted it but the maintenance guy told them everything was going in the trash and if they wanted to pick through the trash they could but no one was being allowed in the apartment. That sure got the gossip flying around the apartment complex.